I’m starting a new series in which some of my favorite food bloggers are assigned to come up with a dish that encapsulates the flavors of the Tom Yam herbal “trinity,” namely lemongrass, galangal, and kaffir lime. The fun is in seeing how these talented guest bloggers incorporate the flavors of these three herbs, heavily used in the Thai cuisine, into various dishes both savory and sweet. To kick off the series, I’m presenting to you the talented and beautiful Pastry Chef Thip of Bonbini! whom I have affectionately dubbed “the Queen of Macarons.” Thip, not only a fellow food blogger but also a fellow Thai, is a San Francisco-based pastry chef and baking instructor who has spent the past several years honing pastry skills in both culinary school and on the job. Thip has recently returned from a trip to Europe where she traveled to different places learning both new and age-old tips and tricks related to pastry in general and French macarons in particular. You can find information on the classes on how to master the art of macaron making which Thip is currently offering here. 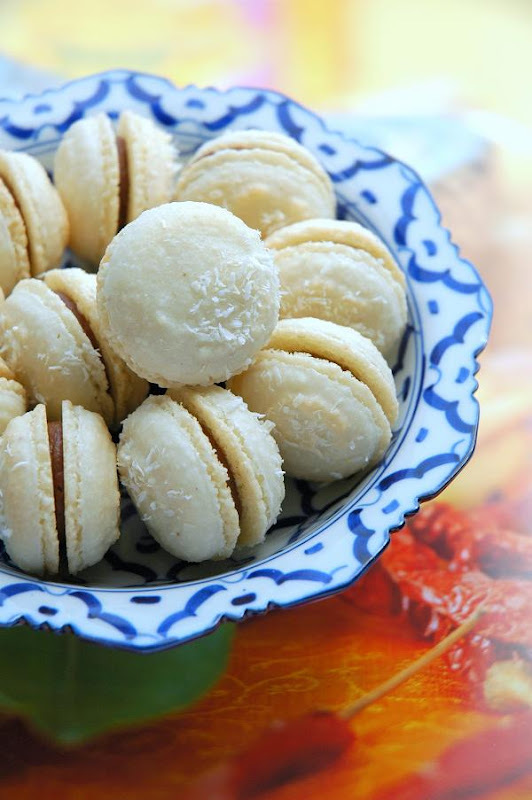 When I first came up with the idea for this Tom Yam Series, interestingly enough, the first food item that crossed my mind was macarons and the first person that I thought of was Thip since I’m not much of a macaron maker. If anyone would be able to pull off something as unprecedented as Tom Yam macarons, it would be the Queen of Macarons herself. I am so honored to have Chef Thip here sharing with you her creation that boasts the bold flavors of our mutual friends: the Tom Yam herbs. This is going to be a fun post to write because I was invited to be the first guest in a series posts on She Simmers. Our conversation started with the host’s idea. She wanted to invite friends to create and post a dish, or preferably dessert, that contains the Tom Yam herbs: lemongrass, kaffir lime leaves, and galangal. Like she said, “interestingly enough,” and I was down with the idea right away! We agreed that I should make Tom Yam macarons. I told her I needed 2-3 days to experiment with the flavor combination before I decided to pick the right one. I’ve used savory flavors in my macarons before, but I’ve never thought about Tom Yam. Personally, I like to make sweet and savory flavored macarons more than sweet and sweet. The macaron shells already contain a lot of sugar, so a savory or salty filling balances out the flavor. So my idea was to make the coconut shells with Tom Yam ganache. I started with the shells by adding some dried coconut into the dry ingredients. I also added coconut extract into egg whites to make sure the flavor would pop up. For the ganache, I used two different chocolates, dark and milk, with fresh herb-infused cream. I didn’t like the outcome, so I did another one with tom yam paste. Voila! It was a perfect combination of sweet and savory, and much to my surprise, really carried the flavor of Tom Yam. The shells were sweet with a taste of coconut and the filling added some sweet, sour, salty and spicy taste. I wish I could give everyone a sample. Create “Mass” by folding almond flour, dried coconut, powdered sugar, coconut extract and 45 g of egg whites together with a big spoon. Make French meringue by whipping egg whites in a mixer on medium speed until foamy. Gradually add sugar in additions and continue whipping to medium peaks. Fold 25% of the meringue into the “Mass” to lighten the mixture. Fold in the rest of the meringue. Do not overmix. Place into a pastry bag with a plain tip #3, pipe 1-inch diameter circles on a sheet pan lined with a Silpat. Let the shells rest until the skins form, about 40-60 minutes. Bake for 12 minutes, rotating half-way through. Let the shells cool on the Silpat, then remove them from the Silpat and sandwich them with the filling. Bring heavy cream and the tom yam paste to a boil. Remove from the heat; stir in milk chocolate, then butter. I have a macaron recipe with Italian meringue here:I use both techniques, French and Italian. However, after some experience, I prefer the French technique. I don’t notice a difference between using aged egg whites or fresh egg whites. I don’t double the sheet pan when using a Silpat. I don’t sift the dry ingredients. Making macaron is all about technique! Awesome! I want to try it for the next batch of macarons I tackle! I was actually fantasizing the other day of macarons flavored like Thai Iced Coffee… and of course, due to it’s sweetness, a macaron version of Mee Krob would probably be to-die-for! Great idea, Leela! And, beautiful macarons, Thip! Sounds like a fantastic flavor combination. Thip, these are beautiful! I wish we could indeed have a sample – I can only imagine the wallop of Tom Yam flavor that these dainty macarons deliver. Leela, what a great series concept and a marvelous way to kick it off! excellent – I unsuccessfully tried to make macarons last week – I am undaunted and I will try again – these sound and look magnificent. I really want to try these, but I’m still intimidated about making macarons. These look so delectable. They really really do. Count on Thip to successfully integrate Asian flavors into pastry. This is so creative! That’s awesome! Very creative, and flavours I’d love to eat. We wish you could give us a sample too! This is a neat idea, and I love the way you made the coconut shells to go with the flavoured filling. Tangled, I freezed some for my student to taste. Doggy, that’s the way to go!! Jenn, don’t be afriad–I’d failed so many times before I got it right. Does the galangal/kaffir lime/lemongrass trinity work with sweet foods? Pardon my ignorance, but I really haven’t the foggiest idea what they taste like (except for kaffir limes). Reason I’m asking is that in about a week there’s the First of May and its traditional spring picnic. Over here we like to drink sima, which is brown sugar + water, fermented to about 2% alcohol by volume. Nice and bubbly. The drink is usually flavored with lemons, but in the last few years I’ve experimented with it. Limes work great, as one would expect. Likewise ginger adds an extra kick. This year I’m out of ideas, and it’s almost time to start making the stuff so I can’t really make a trial run. So, do those ingredients work in a sweet context? Lasse – These herbs are not normally used in sweet applications, at least in Thai cooking (hence the fun in making these macarons). But I do know lemongrass and kaffir lime, being “citrusy,” lend themselves quite well to desserts and drinks. Being much stronger than limes and lemons, kaffir limes aren’t exactly interchangeable with the other two, in my opinion. We don’t juice them to make limeade or lemonade; we use primarily their leaves and zest. So keep that in mind should you want to incorporate kaffir limes into your drink concoctions. They’re strong. Lemongrass is pretty mild, though. Take a whole stalk, bruise it just to release the natural oil, use it to infuse whatever you want, then remove it afterwards. Galangal, on the other hand, … I don’t know man … a little too weird for me in sweet applications. It doesn’t taste like ginger, like, at all. But it would be worth an experiment. What do you think, Thip? Lasse – The leaves of kaffir lime are not as strong as its fruits. You can bruise a few leaves and infuse stuff with them. I love the fragrance of kaffir lime leaves. Here in Chicago, the fresh leaves don’t come by often and the fruits are impossible to find. You never know what works until you try it. Have fun with your experiment! Beautiful macaroons and what an amazing flavor! Thanks for the great recipes and excellent writing. I just linked your recipe for peanut sauce (which I think is the easiest to make, best recipe for it out there) to a post for my readers. I write about stand up paddle surfing but decided to try my hand at a recipe post… it was fun and I hope my readers try out your peanut sauce recipe. Thanks again! Leela what a fun and great idea for a series of posts. Thip – these macarons look amazing. I live in SF, and am curious if you have any to sample around here. I’ve always loved macarons,even before the current craze – the variety of flavors the way they feel when you bite into them, that bit of resistance and then smooth flavor. I have a ready excuse for failure, a badly temperamental stove, and so I have not be brave enough to see if I can even get feet. Funnily enough I just made some tapioca with these flavors, and it never occurred to me until I saw your writing here that these flavors are generally reserved for savory dishes. I can tell you they worked really well coupled with coconut milk in the pudding. Leela, this series got off to a wonderful start, I think Thip set the bar extremely high, I cannot wait to see what the next poster has to offer. Tangled : I just see that you have a boxer too–cute! I freezed some tom yam macarons for my students to try. If you’d like to try it, please contact me by email.